From the above verse one might conclude Ray Benge the happiest of all major-league ballplayers. “[A]fter several seasons of arduous and ignominious work with the chronically failing [Philadelphia] Phils . . . [The Sporting News credited the] ball player who doesn’t flee the Phillies at the first chance.”1 In 1935, future Hall of Famer Casey Stengel echoed this when he said, “Benge is a good pitcher and never has had a break.”2 The hard luck righty spent nearly 90 percent of his 12-year career pitching for clubs with a combined .413 winning percentage. After retiring from organized baseball in 1940, Benge achieved far greater success as the baseball coach for the Sam Houston State University Bearkats in Huntsville, Texas. Over his 12-year tenure the university reached the NAIA World Series six times including its only championship season in 1963. Raymond Adelphia Benge was born on April 22, 1902, 100 miles southeast of Dallas in the small city of Jacksonville, Texas (1900 census: 1,558) as the youngest of eight children (six boys) of William Lovelady Benge and Annie Isabelle (Mullinix) Benge.. His third great-grandfather was John Benge, a native of Albemarle County, Virginia who in the late 18th century began a southwesterly trek across the new country with his growing family in tow. Ray’s paternal great-grandfather, Tennessee native George Clinton Benge, moved to the piney woods of northeast Texas around 1850. Three decades later George’s grandson William—Ray’s father—married Annie Mullinix, a Texas native two years his senior. Except for an older sister, listed as a public-school teacher, the 1910 US census depicts the entire family—including 8-year-old Ray—as a farm hand. Within ten years the Benges had abandoned the farm to move to the slightly larger college town of Huntsville, Texas (1920 census: 4,689). Home to the Sam Houston Normal Institute (later Sam Houston State [Teachers] College, now Sam Houston State University), Huntsville opened new career paths for William as a boarding house proprietor while two more of the kids entered the teaching field. Neither the farm nor boarding house proved lucrative for the Benge family. In an interview with SABR member Herman Wheeler in 1992, Ray remembered the baseball games he and his brothers played with crude homemade equipment like baseballs made from stitched together rolled stockings. Despite the makeshift devices all six boys developed into accomplished sandlot players. Around 1922, when Ray entered college intending to follow his siblings into the teaching field, he found the success he sustained on the collegiate mound continually interrupting his studies. In 1925, after lettering in baseball for four years, Benge left college without completing his degree to play for a team sponsored by the Gulf Oil Corporation. (He likely played for this same team during his summer breaks also). Stationed in Tampico, Mexico, Benge’s reputation as a superb pitcher—he also worked in the company’s tank yard—soon garnered the attention of the professional home team at the hub of the US oil industry: the Class-A Houston Buffaloes of the Texas League. Exactly when the club signed Benge is unknown, but he wasn’t with the Buffaloes long. The Cleveland Indians acquired the thin framed hurler in an unspecified August 1925 transaction. Assigned to the Waco Cubs in the same Texas League, Benge finished the season with a record of 13-10, 4.43 in 187 innings. During the Indians’ 1926 season the emergence of sophomore Dutch Levsen, combined with the rebound of veteran hurler Joe Shaute, crowded the rotation somewhat. Relegated to the bullpen, Benge had two promising appearances before a rough May 5 outing against the St. Louis Browns when he couldn’t get anybody he faced out. Used sparingly thereafter—due in part to a possible injury—Benge was assigned to the Class-B Decatur (Illinois) Commodores in the Three-I League following another rocky appearance on July 5, this time against the White Sox. Recalled by the Indians in September, Benge made one last appearance—three strong innings against the Detroit Tigers—to finish the season with a record of 1-0, 3.86 in 11⅔ innings. The 70⅔ innings he pitched between Cleveland and Decatur would be the fewest for the next 13 years. On January 31, 1927, Benge lost his biggest Indians booster when AL President Ban Johnson persuaded Speaker and Tigers manager Ty Cobb to resign following accusations by former Detroit left-hander Dutch Leonard that both players had conspired to fix a game eight years earlier. Within days of Speaker’s dismissal Benge got reassigned to the Waco Cubs—a move that The Sporting News contributor Casey Jones claimed was “hailed with delight” in the central Texas city.5 Despite a middling 4.09 ERA the right-hander won 19 games and captured near league leading marks in WHIP (1.338) and BB/9 (a full season career best 1.8). Around this time a Texas League sportswriter dubbed the youngster “Silent Cal.” (Years later Benge confessed uncertainty about the origin of the nickname but thought it stemmed from his reticence with the writers). On October 4, at the urging of scout and Philadelphia native Patsy O’Rourke (also credited with signing future Hall of Famer Chuck Klein a year later), the Phillies selected Benge in the rule 5 draft. During the offseason, the Phillies replaced first year skipper Stuffy McInnis with rookie manager Burt Shotton. A former big league outfielder, Shotton looked to Benge and sophomore hurler Les Sweetland to bolster the club’s feeble staff (5.36 ERA in 1927, MLB’s worst). “The twirling corps is stronger than ever,” Shotton boasted, a claim that one sportswriter suggested had caused the new manager to approach “the 1928 baseball campaign looking through rose-tinted glasses.”6 The sportswriter’s instincts proved depressingly accurate. With the Phillies on their way to a then-franchise record of 109 losses, the starting trio of Benge, Sweetland, and veteran righthander Jimmy Ring each placed among league leaders in such dubious categories as losses, and earned runs, walks and home runs surrendered. But even amidst this carnage Benge evinced promise. Only a sixth inning solo home run by centerfielder Jimmy Welsh in a 3-1 contest with the Giants on June 23 prevented his second career shutout. Facing the St. Louis Cardinals two months later Benge, lost a heartbreaking 1-0 duel against future Hall of Famer Jesse Haines. He beat the Boston Braves on September 1, but lost another shutout on a teammate’s eighth inning error. But against the Braves again six days later, Benge finally collected his second career whitewash, scattering 11 hits in a 4-0 win. These were but a couple of sparkles in a fairly ugly season for Benge: he finished with a record of 8-18, 4.55 in 201⅔ innings. Benge and the Phillies opened the 1930 season on an encouraging note—at least as encouraging as it could get for such a team: they went 23-29 through June 21—before both completely collapsed in mid-summer. Beginning with a loss to the Braves in the second game of a July 4 doubleheader, Benge suffered six straight losses thereafter while the Phillies succeeded in winning just 13 of their next 42 contests. Benge and Sweetland each gave up 143 earned runs and, for the second time in three years, both hurlers placed among the league leaders in losses and earned runs,, home runs, and walks surrendered. Benge and Sweetland also yielded career high marks in hits given up with 305 and 271, respectively. But the 1931 season launched a career best four-year run for Benge. Lowering his BB/9 and HR/9 to 2.3 and 0.4, respectively over this stretch, he achieved a career high 14 wins in two of the four seasons. Except for a rough start against the Cincinnati Reds on May 15, 1931, that month was one of the best of Benge’s career: a 1.19 ERA and four victories, including his fifth career shutout. On June 16, he carried a 1-0 three hit shutout into the ninth inning against the Cardinals before back-to-back one out home runs by right fielder George Watkins and Frankie Frisch—the latter a massive drive off the roof of St. Louis’ Sportsman’s Park—sent Benge to a crushing defeat. He collected a career high marks in innings pitched (247) and strikeouts (117) and won seven of his last 10 decisions to finish with his first 14-win season. During the offseason, Benge, to his great displeasure, was rewarded for his work with a pay cut when the Phillies, like other major league clubs, cited financial hardship amid the Great Depression, and reduced roster payrolls. In 1932, for the first time in 15 years, the Phillies actually fielded a competitive club which remained within striking distance of the first-place Cubs through mid-August. Benge contributed to this improvement with his first winning season (13-12); he also placed among the team leaders in appearances (41), starts (28), complete games (13), shutouts (2), innings (222 2/3) and a pace-setting 89 strikeouts. But the team also led the league with 194 errors, many of which contributed to heartbreaking losses. In an August 20 game against the Cubs, for example, a win would have brought the Phillies within four games of first place. Instead, Benge, who was nursing a 5-2 lead in the ninth, allowed two runners to reach base after getting the first two batters out. A grounder to second baseman Bernie Friberg appeared a sure out before the infielder booted the play, allowing one unearned run to score. On Benge’s next pitch, Cubs shortstop Mark Koenig unleashed a towering game winning drive to right field in what Chicago Daily Tribune sportswriter Edward Burns (with more than a little hyperbole) described as “the wildest of wild finishes.”9 This loss would be the first of five straight that essentially buried any Phillie hopes for a pennant. The Phillies offered Benge on the trade block during the offseason in hopes of shoring up their field work. It wasn’t a bad move: since his breakout in 1931 the righty had been among the most pursued players on the Phillies roster. On December 15, 1932, the club sent Benge and $15,000 to the Dodgers for second baseman Neal Finn, righthander Cy Moore and utility infielder Jack Warner. The prize for the Phillies was slick fielding Finn whose projected presence would allow the Phillies “infield [to] function more efficiently.”10 Meanwhile the Dodgers, whose 1932 pennant pursuits had been lost due largely to poor pitching, looked to Benge, newly acquired righthander Boom-Boom Beck, and soon-to-be acquired veteran hurler Ownie Carroll to fortify the rotation. The following spring Benge was one of the last players to sign a Dodgers contract. His holdout appears to have contributed to manager Max Carey’s decision to place the righty in the Dodgers’ bullpen at the start of the regular season. With just four starts through May, Benge’s early contributions were negligible: 0-3, 5.40 with one save in 30 innings. Over the next two months he delivered a brilliant June (6-0, 1.29) and a lackluster July (0-7, 3.90). (That the Dodgers managed just 10 runs over his seven losses wasn’t much help.) 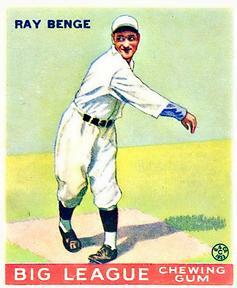 On August 8, Benge delivered an 11-inning complete game 1-0 shutout against the Giants before finishing the season with a record of 10-17, 3.42 in 228⅔ innings. His club scored two runs or less for him in 11 of his 17 losses. The disappointing results contributed to the team’s second division finish and a record of 65-88, tying the franchise’s worst finish since 1912. Benge and Mungo accounted for nearly half the Dodgers’ 71 wins, and more than half of the staff’s 66 complete games, as the club tumbled to its second straight second division finish. Though struggling with arm problems through portions of the season, Benge finished with a respectable record of 14-12, 4.32 in 227 innings (five of the losses came when the Dodgers were shutout). After five consecutive seasons of 200-plus innings (and six of the previous seven years, having missed the 200-inning threshold by one in 1929), the righty never reached this mark again. Having added a knuckleball and screwball to his repertoire (pitches he had been sparingly experimenting with before 1936), Benge used the off-speed junk to collect wins in each of his first four appearances (three starts) of the season. But visions of a continued comeback were quickly dispelled when the righty was knocked out in the second inning in two successive starts in late May. Placed on waivers following a rough start against the Cardinals on July 19, the Phillies picked him up eight days later. Capturing a win in his first appearance with his former team, Benge struggled the rest of the way, 14 outings, to finish the season with a record of 8-13, 5.49 in 160⅔ innings. In December, he was sold to the St. Paul Saints (the White Sox Double-A affiliate in the American Association). Upset at the contract he received from the Saints, Benge refused to sign and was eventually released. He sat out the 1937 season and at 34 appeared to be through with organized baseball altogether. On February 5, 1938, Cardinals executive Branch Rickey, concerned for the welfare of sore armed hurlers Paul and Dizzy Dean, purchased 36-year-old Guy Bush from the Bees and signed Benge as a free agent. Though Bush survived the club’s spring training—he made just six appearances for the Cardinals in 1938—Benge was not as fortunate: on April 18, one day before the start of the season, he was released. Quickly picked up by the Reds (most likely at the urging of manager Bill McKechnie, Benge’s former Bees skipper) the righty was slotted at the back of the bullpen where he garnered some initial success—one win with a 3.00 ERA and one save in his first five appearances (12 innings). In a raucous game against the Cardinals on May 15, Benge entered the ninth inning of an 11-11 tie and retired the side in order. Greeted by a leadoff triple in the 10th, Benge absorbed the loss when he surrendered a game winning single to pinch-hitter Pepper Martin. Benge collected a save against the Dodgers on May 22 and faced off against the same team 11 days later in what proved to be his last major league appearance. Escaping a Dodgers run scoring opportunity in the seventh, he gave up a two-run double to Dodger catcher Babe Phelps the next inning and was lifted for lefthander Lee Grissom in the ninth. Just over a week later Benge was released to the Reds Double-A affiliate Syracuse Chiefs in the International League. He spent the remainder of the season with the Chiefs and returned to the club in 1939 but was released in February 1940. Benge appeared twice with the Shreveport Sports in the Texas League that season before retiring. Benge returned to his Huntsville, Texas, home where he resumed his pursuit of the teaching degree that he’d put aside more than 15 years earlier. He subsequently launched a long career in education, although it’s not clear at what level(s) he taught. Beginning around 1950, Benge also began working with Sam Houston State University’s baseball team alongside famed coach Samuel Hayden “Hap” Malone. In 1957, Benge took the reins from Malone and, within four years, led the Bearkats to the NAIA College World Series. The club appeared in the Series for the next six years and finally captured the title in 1963. A year later Benge was selected as the NAIA Coach of the Year. During his 12-year head coaching career he laid in a spectacular .699 winning percentage while also helping to usher the careers of future major leaguers Ken Boswell, Fred Beene, and Phil Hennigan. In 1968, Benge retired as a head coach though there is some indication he continued teaching for several years thereafter. In 1971, he was among the first inductees into the Sam Houston State University’s Athletic Hall of Honor. Around the time Benge launched his playing career he married Cecil Beatrice “BeBe” Cochran, a Texas native four years his junior. In 1942, the union produced one son before dissolving in divorce. In July 1942, Benge enlisted in the US Navy where he served as an officer through most of World War II. He later married Edna Barrett, another Texas native who was 16 years younger than he. This union survived until his death, producing one daughter. On September 6, 1965, Benge participated in an Old Timers Game in Houston’s Astrodome alongside former Texas League All Stars Paul Dean and Howie Pollet. Three decades later, on June 27, 1997 (two months after his 95th birthday), Benge died in Centerville, Texas, a small city located halfway between Dallas and Houston. He was buried in Concord Cemetery, 10 miles west of Centerville. In 1934, midway through his illustrious Hall of Fame career, Pittsburgh Pirates right fielder Paul Waner tagged Benge as one of the two toughest pitchers he’d faced in his career. “[He] gave me lots of good balls to hit at,” Big Poison claimed. “[E]ven so I [just] couldn’t connect.”15 Unfortunately, success against the Pirates slugger (.237 with one home run and 12 RBIs in 59 at-bats) didn’t characterize typical success for the righthander. Benge, who played for losing teams for most of his 12-year tenure in the majors, managed only a pedestrian record of 101-129, 4.52 in 1,875⅓ career innings. In addition to the sources cited in the Notes, the author consulted Ancestry.com and Baseball-Reference.com. The author wishes to thank Tom Schott for review and edit of the narrative. 1 “Offer of $9,550 Lures Wilson to Camp, But Hack Insists He’s Still a Holdout,” The Sporting News, March 9, 1933: 8. 2 “Brandt Gives Casey More Elbow Room,” ibid., December 19, 1935: 1. 3 Ray Benge interview with Brent Kelley, July 2, 1993. 4 “Spoke Puts Faith in What He’s Got,” The Sporting News, November 19, 1925: 8. 5 “Waco Seems Assured of Good Mound Staff,” ibid., February 10, 1927: 1. 6 Gregory H. Wolf, “Les Sweetland,” SABR BioProject. Accessed December 25, 2016 (http://bit.ly/2i6a5Kh). 7 Twice matched over the next 32 years, the mark was shattered by righthander Art Mahaffey—with 17—in 1961. 9 Jack Bales, “The Show Girl and the Shortstop,” SABR Baseball Research Journal, Fall 2016: 71. 10 “From Fill-In to Phil,” The Sporting News, January 19, 1933: 1. 11 “Training Camp Notes,” ibid., March 22, 1934: 5. 12 “Hot Weather Harmony,” ibid., July 19, 1934: 4. 13 “Brandt Gives Casey More Elbow Room,” ibid., December 19, 1935: 1. 14 “M’Kechnie Studies Bee Replacements,” ibid., April 2, 1936: 2. 15 “Crown Second for ‘Big Poison’ After Wait of Seven Seasons,” ibid., November 1, 1934: 3.